Two turkeys, one named "Caramel" and the other "Popcorn," are presented to the press in Washington on Nov. 26, 2013. The annual ceremony of the presidential turkey pardon is so ingrained in the American Thanksgiving tradition that it might seem as old as the holiday itself. But the ritual of White House clemency for a pair of lucky fowl is actually relatively recent. President Barack Obama will officially pardon "Popcorn" and "Caramel" this week at the White House. President Harry Truman is often cited, incorrectly, as the first president to pardon a Thanksgiving turkey. Adding to the confusion, President Bill Clinton attributed the first Thanksgiving-related poultry acquittal to Truman during his own pardoning session in 1997. 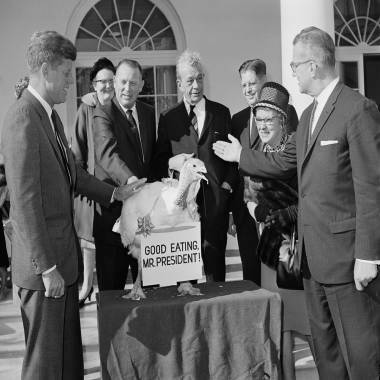 In fact, Truman was fairly blunt about the fact that the tasty birds that came to the White House weren’t exactly headed toward blissful retirement after a high-profile political absolution. President Bill Clinton gestures toward a turkey presented to him at the White House in Washington, Wednesday, Nov. 24, 1993 by the National Turkey Federation as the Federation's President Stuart Proctor looks on. "Truman sometimes indicated to reporters that the turkeys he received were destined for the family dinner table," the library wrote. It appears that Abraham Lincoln, in a way, was the first to spare a turkey. But it wasn't a Thanksgiving turkey. It was a turkey his son adopted as a pet during the Christmas season, which is apparently the kind of thing kids did in the mid-1800s. "[T]he tradition actually began 83 years earlier when President Lincoln received a turkey for Christmas holiday,” Clinton said during that same 1997 speech. “His son, Tad, grew so attached to the turkey that he named him 'Jack,' and President Lincoln had no choice but to give Jack the full run of the White House." President John F. Kennedy reaches out to touch a 40-pound turkey presented to him Nov. 19, 1963, at the White House. One more – albeit morbid – note about these pardoned birds. They're bred to be eaten, and they only live an average of two years after the leave the White House. On that appetizing note, enjoy your Thanksgiving dinner! An earlier version of this history of turkey pardons – “Beg your (Turkey) pardon” -- was first published in First Read on Nov. 25, 2009.